As you leave Castle Street to start to follow The Convent Walk you are between the Millstream and the western Arm of the River Avon behind you is Town Bridge. You are standing on a triangle of land at the south west side of Town Bridge. A medieval bridge of five arches, under which were recovered cannonballs from the civil war assault on the Castle. It used to be so narrow that two carriages could not pass each other. In 1899 part of the house on the north side, ‘Quartleys’, was taken down for the bridge to be widened, but it is still single file traffic today! On the Christchurch Blue Plaques Millennium Trail Leaflet1 this location is identified as number 17, but there is no plaque erected. 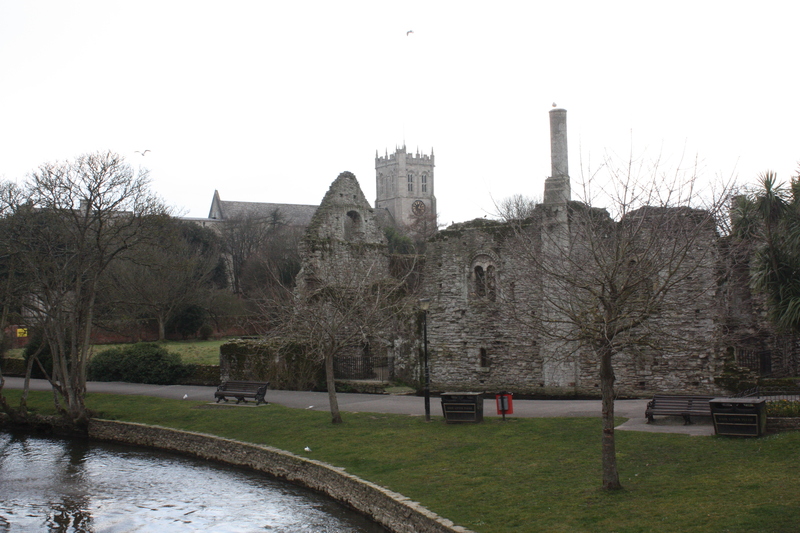 As you walk further down The Convent Walk you will get a good view on the right of Christchurch Castle on a mound and its luxurious stone hall, Constable’s House. The Grade I listed Christchurch Castle is of Norman origin and was originally of a motte and bailey construction. 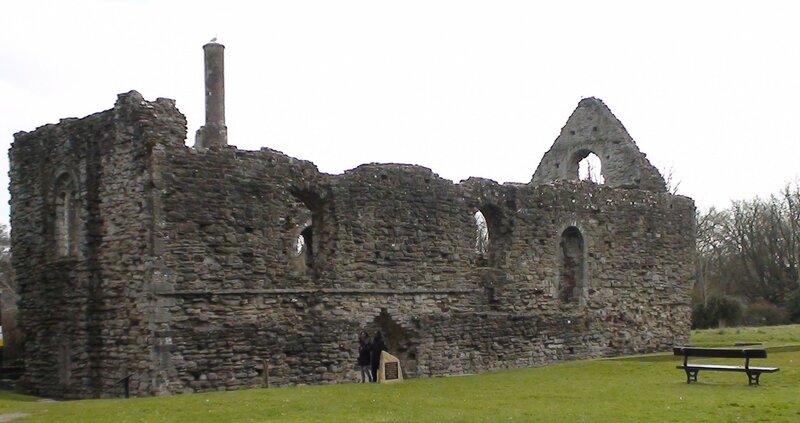 The castle once dominated the town, possibly to show Norman dominance over their Saxon predecessors, but now lies in ruins and only a couple of the keep walls remain. A castle has stood in Christchurch since approximately 1074 AD when William I fortified the town with a wooden fort on a motte. The original wood tower castle was probably built to hold down the inhabitants of the Saxon burgh. The bailey extended to the mill stream and held stables, kitchen and other utility buildings and the elegant stone hall known as Constable’s House. After the Norman Conquest the burgh’s defences were modified with a ditch and bailey surrounded by a wooden palisade. At the start of the 12th century Christchurch was granted by King Henry I to Richard de Redvers first cousin to King Henry I, Richard rebuilt a wooden fort and then in about 1150 a stone keep was built by his son Baldwin de Redvers. The Castle was last garrisoned during the Civil War and a contemporary report of its surrender with a list of its Royalist Officers is printed in the Christchurch Miscellany. The castle saw action during the Civil War of 1642–1651 when occupied by the Parliamentarians. Christchurch changed hands a number of times originally under Royalist control, it was captured by Sir William Waller’s Parliamentary army in 1644. Lord Goring briefly retook the town in 1645 and laid siege to the castle. However, the Parliamentarians withstood the siege and maintained their hold in the town. Fearing such a powerful stronghold might once again fall into Royalist hands, Cromwell ordered the castle to be destroyed in 1652 so that it could not be used should there be an attempt by the Royalist to put Charles II on the throne. The buildings in Church Street and the back gardens of the Castle Street shops now occupy the moat’s site. On the Christchurch Blue Plaques Millennium Trail Leaflet1 this location is identified as number 14 but there is no plaque erected. Within the curtain wall of the castle, and located on the Mill Stream, stands the Constable’s Hall, known more commonly as Constable’s House, a Grade I listed Norman dwelling. Much of the building’s stonework remains, including a rare example of a Norman chimney and the privy which extends out across the mill stream. Constable’s House probably built about 1160 of stone to house the Lord of the Manor’s Constable or Bailiff to provide more elegant and comfortable domestic quarters and was defended by cross bow loops to the north and east, covering the Avon. The ground floor was a storeroom, whilst the first floor hall was the room in which men lived and slept with a portion to the south enclosed as a Solar, or private chamber, for the feudal family women and children. The hall had a large fireplace with a fine Norman chimney, one of only five examples in England. A stair tower in the north east corner of the wall lead from the ground to the crenellated wall walk from which long bow archers could command the Avon at the river crossing at Town Bridge. The roof of the Hall was probably covered with Plympton slate. The main entrance to the Hall was from a wooden stairway inside the bailey. Constable’s House underwent a number of improvements over time. A toilet, or garderobe, was built over the millstream to provide the facility to the private chamber on the first floor. A doorway was cut through the east wall of the storeroom to enable direct access to the millstream when Baldwin de Redvers made an agreement in 1257 with Christchurch Priory to enable his boats free passage along the millstream. This gave access for casks of wine to be reloaded at Town Quay onto flat bottomed salmon punts which could enter the Mill Stream via Gin Door, which became a fish trap. Alongside the Constable’s House runs the Mill Stream and further East is the River Avon. On the Christchurch Blue Plaques Millennium Trail Leaflet1 this location is identified as number 19 but there is no plaque erected. 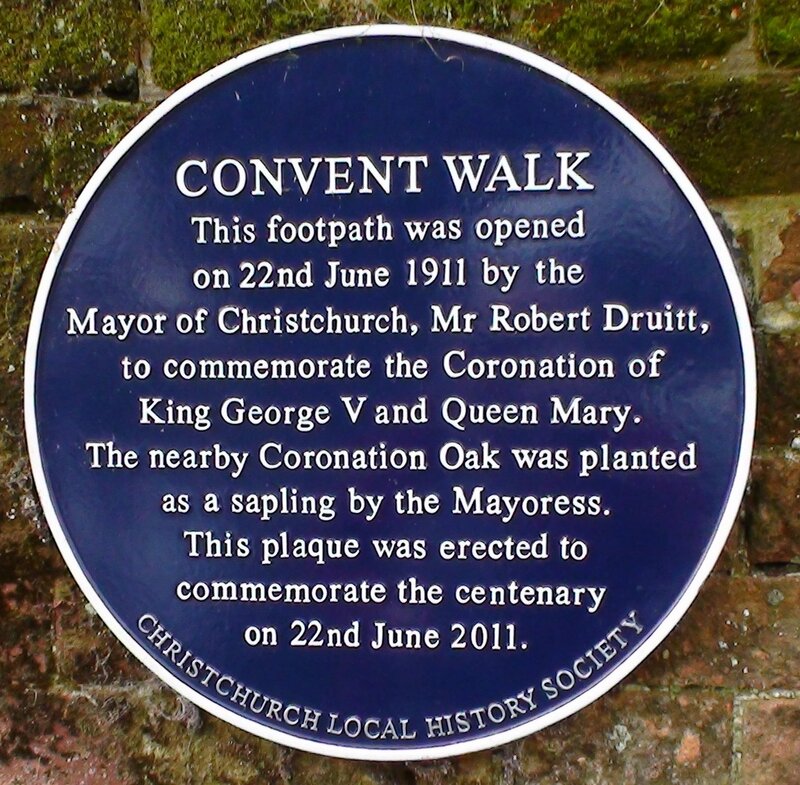 The footpath from Castle Street down to Christchurch Quay is known as the Convent Walk it is a path walked by many generations before. The name derives from it being on part of the Priory land, Convent Meadow or ‘Covey Garden’. On its southern boundary was a great stone wall, probably where the ‘Gin Door’ is now. As you entered from Castle Street you walked across the sites of a late 17th century blacksmith’s and a post house at which travellers changed their tired horses before continuing on their journey. 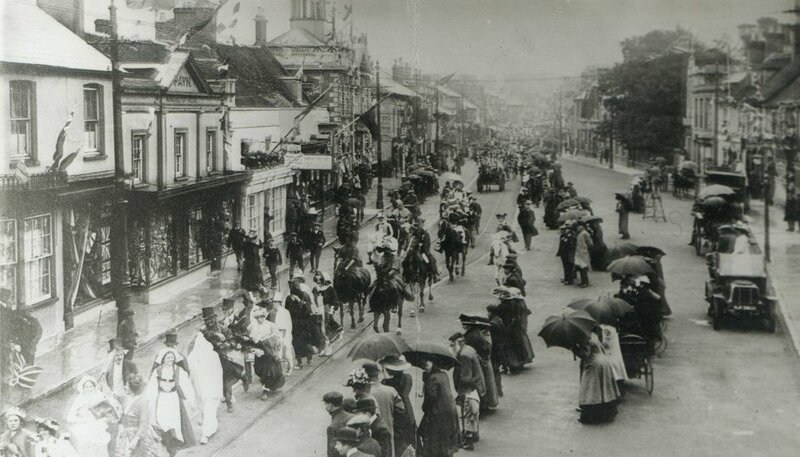 Convent Walk was laid to celebrate the coronation of George V in 1911 with whose accession the Edwardian era had come to an end. For the occasion an enthusiastic programme of events was held including an illustrated flotilla of decorated boats on the river. From the Christchurch History Society Archives it has been established that the concept of providing a footpath alongside the Mill Stream had been proposed in 1907 by Councillor William Burt, a solicitor. In response to the proposal the Borough Surveyor said that the scheme ‘would greatly improve that already beautiful part of the district’. The scheme however did not come to reality until King George V came to the throne in 1910 when the opportunity of a commemorative walk was taken. 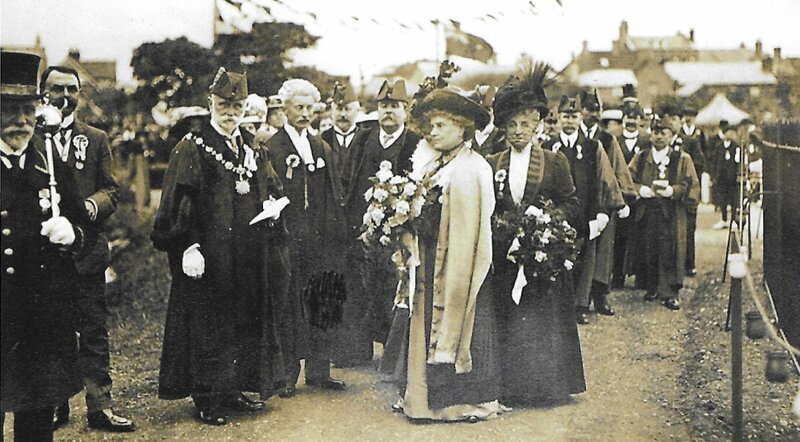 The Mayor, Robert Druitt presided over the events which included the official opening of the Gin Hatch Door with a silver key whilst the Mayoress used a pair of coronation scissors to cut a ribbed across the path. 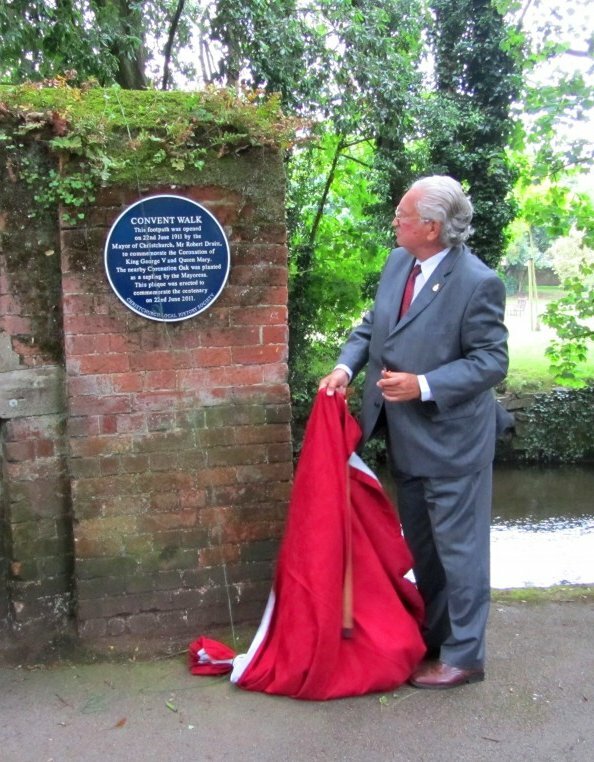 One hundred years later, on 22nd June 2011, an additional Blue Plaque was erected by the then Christchurch Local History Society (now Christchurch History Society) and unveiled by Michael Hodges, the then Chairman of the Christchurch Local History Society to mark the centenary. 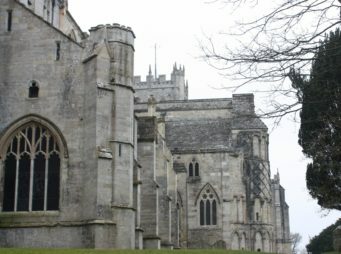 As you continue walking along The Convent Walk you come to the Eastern face of Christchurch Priory and the remains of a structure was thought to be a tower until it was excavated in the late 1960’s by local archaeologist Michael Ridley. He identified it as a monastic toilet block or garderobe, and the discovery of spring stones, found at the base of arch, was evidence that the Mill Stream originally flowed under the building, much like the garderobe upstream at the Constable’s House. This one was for the Canons at Christchurch Priory. 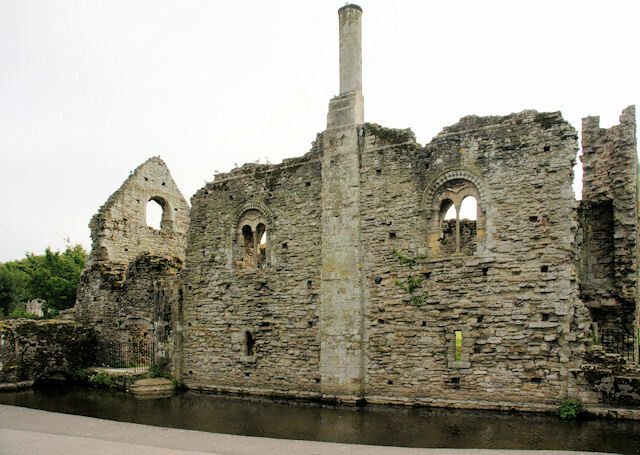 Evidence that the Priory garderobe utilised the Mill Stream comes from an inquisition conducted in 1281. 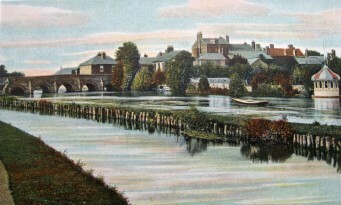 The case, recorded in the Christchurch Priory Cartulary, was to establish whether or not the Mill Stream had been illegally diverted. It is clear that with two garderobes in such a short length of the Mill Stream hygene was not a high priority, particularly with Place Mill so close. When partially excavated the Priory Garderobe was found to contain unexpected items such as seventeen pieces of leather, mostly shoe remnants of a design dating to before the mid-15th century, numerous small objects, including a buckle, riveted strap end, thimble, needles, and knife handles. There were bone fragments, mainly sheep or goat, pig, cattle, and domestic fowl. The tour then goes over the bridge across the Mill Stream to Place Mill.